Be the first to get this amazing new book! An outstanding new guide for all 50 states! "The Traveler's Gun & Knife Law Book"
This book even covers Washington D.C.! Attorney David Wong is an attorney in private practice, a martial artist and an NRA-certified firearms instructor. He is an adjunct instructor at the Sig Sauer Academy in New Hampshire (the "Live Free Or Die" state), where he teaches self-defense law and the Basic Threat Management course for armed citizens. 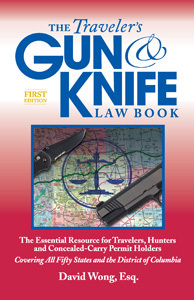 The book was inspired by his extensive cross-country travels and his need to have concise, accurate summaries of the gun and knife laws of each state. Get both for the best coverage!